Perhaps it is my lifelong fondness for horror movies, or the strange joy of sharing scares with your fellow man, but I’ve always loved Halloween to the point where it runs neck and neck with Christmas for my favorite holiday of the year. Naturally then I sought out the best horror app I could find to honor the holiday, but ran into a bit of a problem when I ran across two worthy candidates. Rather than just give one a mention and highlight the other, I’ve decided to break the format a bit and present two horror gaming apps of different styles, but equal worth. “Dead Trigger 2” is the sequel to the notorious mobile zombie FPS game “Dead Trigger,” and as the title may suggest, does little to stray from the template that series established. 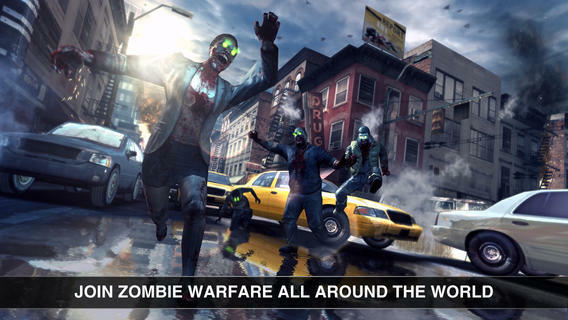 In other words, you’re still shooting a variety of zombies with a plethora of weapons, all while gawking at some of the best mobile graphics this side of “Infinity Blade.” There are some changes to be found here, including an optional button free control schematic (it works pretty well actually), and a much more varied mission structure, but for the most part you’re still just wandering around and mowing down zombies. That may sound like a knock, but it’s actually far from it. The original “Dead Trigger” found a niche in the mobile market by being a shooter that didn’t feel too far removed from its larger and more technically capable console brethren. It’s a role carried on by “Dead Trigger 2” which may make a host of technical and gameplay improvements implemented to make the game a smoother experience all around, but do nothing to hamper the core mechanics which made this game so much fun in the first place. The brilliant thing about the action in this game is that it’s the one place that actually acknowledges any sort of need to be limited by the mobile platform. It resorts, then, to a more classical style FPS which was all action, all the time, and feels like a breath of fresh air in a genre that’s becoming more and more tactical and cinematic based. There’s a cinematic quality to “Dead Trigger 2” to be sure, but it only serves to provide a loose justification and reasoning for shooting everything in sight. “Dead Trigger 2” strikes a rare balance in mimicking the benefits of console gaming while taking advantage of mobile gaming’s capabilities to provide an experience that feels ambitious yet simple, and never fails to be fun. Fun is actually the key here, as while “Dead Trigger 2” makes some tremendous strides in giving the series depth, ultimately they’re really superfluous when weighed against the game’s true job of throwing wave after wave of horror at you, and leting you shoot your way out of it, which it does with twisted levels of joy and ease. “Indigo Lake” is a horror game of a different tune. While “Dead Trigger 2” used it’s horror as a backdrop for some classic shoot em’ up gameplay, “Indigo Lake” is a more pure horror game that ventures into the rarely successfully explored area of psychological horror. In it you play a paranormal investigator sent to solve a string of suicides in a small town. Fairly ambitiously, you do this in an open world setting which you’re able to explore on foot and in-vehicle. You’re objectives in this environment are pre-defined, but the manner and order in which you approach them is yours to decide. 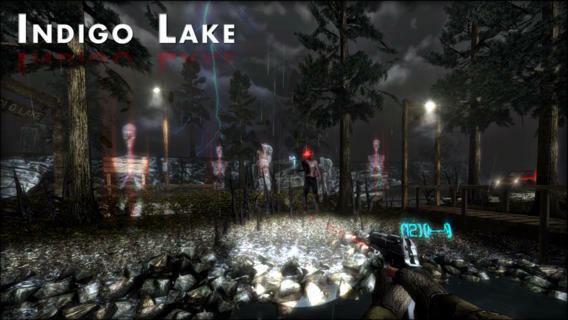 Many horror games require intense structure to place their scares in, which “Indigo Lake” abandons in favor of a more open, yet carefully restrained experience. While you do have a gun in the game, it’s used sparingly as instead you’ll spend most of your time solving puzzles and trying not to jump out of your skin as you slowly unravel the specifics of what is going on. The way the game never reveals it’s full hand at once turns out to be one of its great attributes, as you spend more time waiting on the big scares to happen, as opposed to experiencing them. This lends the rest of the game an intense feeling of dread and unease which is absolutely perfect for a murder mystery, as you never really feel comfortable or confident while playing until you reach your next big break (even then the empowerment is usually momentary). “Indigo Lake” is a horror game for the patient user then, making it the polar opposite of “Dead Trigger 2,” and an interesting companion piece as well. To go much further into the game would run the risk of spoiling it, so I’ll stop by saying that those who are both patient and brave enough to stick with it despite the well played series of scares implemented to ward you off will find a game that manages to serve as a rare example of physiological horror done well, and therefore a unique horror game not just on the mobile scene, but in all of gaming. There you have it. Two horror games which may take wildly different paths within the genre, but find an equal level of success in their endeavors. For the people that want to feel like Rambo in the middle of the zombie apocalypse, there is “Dead Trigger 2.” For those who want something closer to an episode of the “X-Files,” there is the brilliant “Indigo Lake.” If you’re a true horror fan though, I highly recommend both as they not only serve as the perfect primers for Halloween, but exhibit enough quality to be worth a play any time of the year, and are therefore equally worthy of being recognized as app of the week.